The new Draft Bylaws will be posted in ASL and formally open to members for review. At that time, a 45-day feedback period will begin, and a deadline date for feedback will be announced. 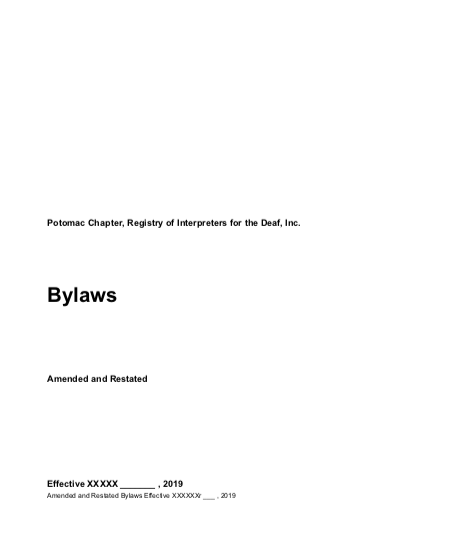 You may review the Draft PCRID Amended and Restated Bylaws in English text by clicking on the document above. You may share your feedback with the PCRID Bylaws Committee at Bylaws@pcrid.org. The Bylaws Committee will collect the feedback and share it with the attorney assisting PCRID from the Maryland Law Association for Non-Profit Organizations.